Thomas Hardy wrote this poem for the last day of the year and century, 31st December, 1900 - hence "the century's corpse". The first two stanzas are bleak enough, but as Hardy poems go, this one is extraordinarily optimistic. 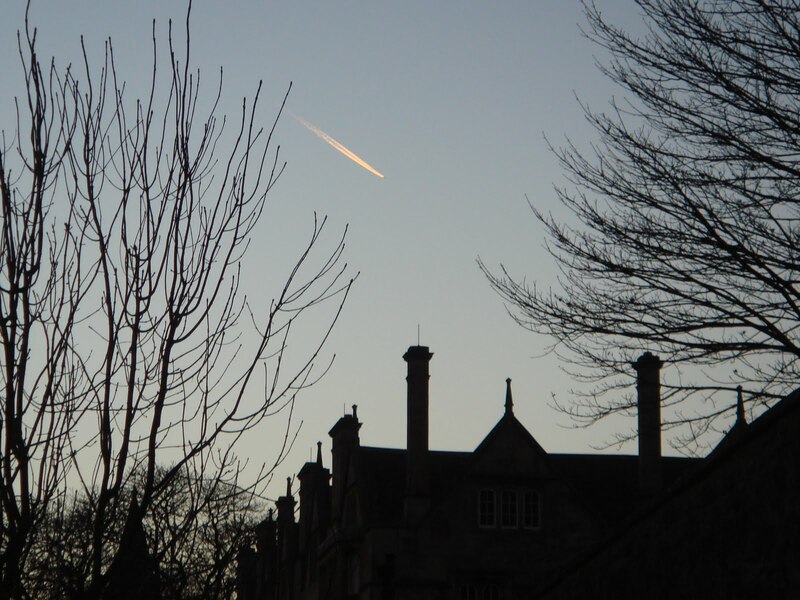 The pictures are from Ickham, Kent, on the last day of 2009. Murdered Archbishops of Canterbury are something of a specialism of this blog, and St Thomas Becket, who died on 29th December 1170, is the most famous of them all (I'll continue to do my bit for the memory of St Alphege, however). I've written before about the dramatic service of Vespers which every year commemorates the anniversary of Becket's death at Canterbury Cathedral. There they sing Palestrina and plainchant, all in Latin (and very beautiful it is by candlelight), but there are also English songs composed in honour of St Thomas surviving from the medieval period. When Henry VIII ordered that all memorials of St Thomas be destroyed, some of these songs were crossed out of their manuscripts, or the name 'Thomas' scratched out; but a number survived, and this is one of them. 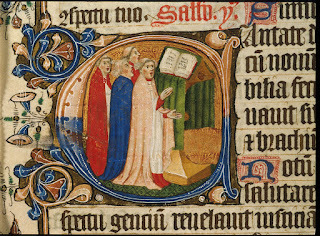 It's found in four manuscripts but this text, no.24 in Richard Greene's A Selection of English Carols, is based on the fifteenth-century MS. Sloane 2593 (which also contains some of the most famous medieval Christmas carols, including 'Myn lykyng, 'I sing of a maiden', and 'Adam lay ybounden', among others). With dedly wondys thei gunne him hurte. By the power of the devil. To suffer the pain of death. He hoped for the joys of heaven. With deadly wounds they began to hurt. The '52 points' refers probably to an expanded list of the 16-point Constitutions of Clarendon, on which Becket disagreed with King Henry, ultimately to his own destruction. This is an exquisitely sad nativity song, a lullaby addressed to the baby Christ, but full of compassion and pain and regret for the suffering that the child will later undergo. It's from the same manuscript as this lullaby and is on roughly the same subject, but this is a much finer treatment (they both come from a book belonging to the friar John Grimestone, who may or may not be the author). Today's lullaby is also very close in style and theme to this poem in the same metre, which is not addressed to Christ but to an ordinary baby - that anonymous poem laments the sorrows of the world and the human condition, while this focuses on the sorrows of Christ. In both cases the central image is of the crying child, innocent and ignorant, who weeps for no reason - and yet has a reason to weep, though he doesn't know it, because of the world he has been born into. This poem perfectly illustrates that idea. From the rose Mary, flower of flowers! Sing, heaven imperial, most of height! For Christmas Eve, and following on from Ælfric's Advent sermon which I posted a few weeks ago, here are some extracts from his sermon on the Nativity. I don't know what kind of homily you will hear in your church this Christmas, but this is what you might have heard if you wandered into an Anglo-Saxon church somewhere in Wessex, around the year 990. We wyllað to trymminge eowres geleafan eow gereccan þæs Hælendes acennednysse be ðære godspellican endebyrdnysse: hu he on ðysum dægðerlicum dæge on soðre menniscnysse acenned wæs on godcundnysse. Lucas se Godspellere awrat on Cristes bec, þæt on ðam timan se Romanisca casere Octauianus sette gebann, þæt wære on gewritum asett eall ymbhwyrft. Þeos towritennys wearð aræred fram ðam ealdormen Cyrino, of Sirian lande, þæt ælc man ofer-heafod sceolde cennan his gebyrde, and his are on ðære byrig þe he to gehyrde. Þa ferde Ioseph, Cristes foster-fæder, fram Galileiscum earde, of ðære byrig Nazareð, to Iudeiscre byrig, seo wæs Dauides, and wæs geciged Bethleem, forðan ðe he wæs of Dauides mægðe, and wolde andettan mid Marian hire gebyrde, þe wæs þa gyt bearn-eaca. Đa gelamp hit, þaða hi on þære byrig Bethleem wicodon, þæt hire tima wæs gefylled þæt heo cennan sceolde, and acende ða hyre frumcennedan sunu, and mid cild-claðum bewand, and alede þæt cild on heora assena binne, forþan þe ðær næs nan rymet on þam gesthuse. You might be able to recognise bits of that even if you've never seen Old English before - it's a paraphrase of perhaps the most familiar piece of prose in the English language. "forðan ðe he wæs of Dauides mægðe" 'because he was of the lineage of David'... "hire tima wæs gefylled þæt heo cennan sceolde" 'the days were accomplished that she should be delivered'... "and mid cild-claðum bewand, and alede þæt cild on heora assena binne" 'and wrapped him in swaddling clothes, and laid him in a manger'... "forþan þe ðær næs nan rymet on þam gesthuse" 'because there was no room for them in the inn'. Yes, the Old English word is 'guesthouse'! Mary gave birth to her first-born son on this day and wrapped him in swaddling-clothes, and because of lack of room she laid him in a manger. That child was not called her first-born because she afterwards had other children, but because Christ is the first-born of many spiritual brethern. All Christians are his spiritual brethern and he is the first-born in grace and in divinity, born of the Almighty Father. He was wrapped in poor swaddling-clothes so that he could give us the immortal garment which we lost at the beginning of the world through man’s transgression. The Son of Almighty God, whom the heavens could not encompass, was laid in a narrow manger so that he could save us from the narrow confines of hell. Mary was a stranger there, as the Gospel tells us, and the crowd of people meant the inn was very full (the Old English word is genyrwed, 'narrowed, made crowded'). The Son of God was crowded in his inn, so that he could give us spacious room in the heavenly kingdom, if we obey his will. Angels often appeared to men under the old dispensation, but it is not written that they came with light; this honour was chosen for the glory of this day, that they revealed themselves with heavenly light when that true light, the merciful and just Lord, appeared in darkness to the righteous. The angel said to the shepherds, “Do not be afraid; behold, I bring you great joy which has come to all people, because today for you the Saviour Christ is born in the city of David.” Truly he brought them news of great joy which will never end, because the birth of Christ gladdened those in heaven, earth and hell. The angel said, "Today for you the Saviour Christ is born in the city of David". He was right to say "today" and not "this night", because Christ is the true day, who by his coming drives away all the dark ignorance of the old night and enlightens the whole world by his grace. We should always keep in our memories the sign which the angel revealed to the shepherds, and thank our Saviour that he humbled himself to become a sharer in our mortality, taking on human flesh, and being wrapped in poor swaddling-clothes. Mine gebroðra þa leofostan, ure Hælend, Godes Sunu, euen-ece and gelic his Fæder, se ðe mid him wæs æfre buton anginne, gemedemode hine sylfne þæt he wolde on ðisum dægðerlicum dæge for middangeardes alysednysse beon lichamlice acenned of þam mædene Marian. He is Ealdor and Scyppend ealra godnyssa and sibbe, and he foresende his acennednysse ungewunelice sibbe, forðan ðe næfre næs swilc sibb ær þam fyrste on middangearde, swilc swa wæs on his gebyrdetide, swa þæt eall middangeard wæs anes mannes rice underðeod, and eal mennisc him anum cynelic gafol ageaf. Witodlice on swa micelre sibbe wæs Crist acenned, se ðe is ure sib, forþan ðe he geþeodde englas and men to anum hirede, þurh his menniscnysse. Maria acende ða hire frumcennedan sunu on ðisum andweardan dæge, and hine mid cild-claðum bewand, and for rymetleaste on anre binne gelede. Næs þæt cild forði gecweden hire frumcennede cild swilce heo oðer siððan acende, ac forði þe Crist is frumcenned of manegum gastlicum gebroðrum. Ealle cristene men sind his gastlican gebroðra, and he is se frumcenneda, on gife and on godcundnysse ancenned of ðam Ælmihtigan Fæder. He wæs mid wacum cild-claðum bewæfed, þæt he us forgeafe ða undeadlican tunecan, þe we forluron on ðæs frumsceapenan mannes forgægednysse. Se Ælmihtiga Godes Sunu, ðe heofenas befon ne mihton, wæs geled on nearuwre binne, to ði þæt he us fram hellicum nyrwette alysde. Maria wæs ða cuma ðær, swa swa þæt godspel us segð; and for ðæs folces geðryle wæs þæt gesthus ðearle genyrwed. Se Godes Sunu wæs on his gesthuse genyrwed, þæt he us rume wununge on heofonan rice forgife, gif we his willan gehyrsumiað. Gelome wurdon englas mannum æteowode on ðære ealdan æ, ac hit nis awriten þæt hi mid leohte comon, ac se wurðmynt wæs þises dæges mærðe gehealden, þæt hi mid heofenlicum leohte hi geswutelodon, ða ða þæt soðe leoht asprang on ðeostrum riht geþancodum, se mildheorta and se rihtwisa Drihten. Se engel cwæð to þam hyrdum, “Ne beo ge afyrhte; efne ic bodige eow micelne gefean, ðe eallum folce becymð, forðan þe nu todæg is acenned Hælend Crist on Dauides ceastre.” Soðlice he bodade micelne gefean, se ðe næfre ne geendað; forðan þe Cristes acenndenys gegladode heofenwara, and eorðwara, and helwara. Se engel cwæð, “Nu todæg is eow acenned Hælend Crist on Dauides ceastre.” Rihtlice he cwæð ‘on dæge’, and na ‘on nihte’, forðan ðe Crist is se soða dæg, se ðe todræfde mid his tocyme ealle nytennysse þære ealdan nihte, and ealne middangeard mid his gife onlihte. Þæt tacen þe se engel ðam hyrdum sæde we sceolon symle on urum gemynde healdan, and þancian ðam Hælende þæt he gemedemode hine sylfne to ðan þæt he dælnimend wære ure deadlicnysse, mid menniscum flæsce befangen, and mid wacum cild-claðum bewunden. Thorlak had studied in England - specifically, in Lincoln, after a spell in Paris. The account of his life in Þorláks saga (which is online here, if you can read Old Norse) says that in Lincoln he "acquired a great amount of learning, and thereby benefited both himself and others". Soon after his death, Thorlak began to be honoured as a saint in Iceland - and apparently in England too. According to Þorláks saga, early in the thirteenth century there was a man named Auðunn living in England in a place the saga calls 'Kynn', usually taken to be King's Lynn, in Norfolk. 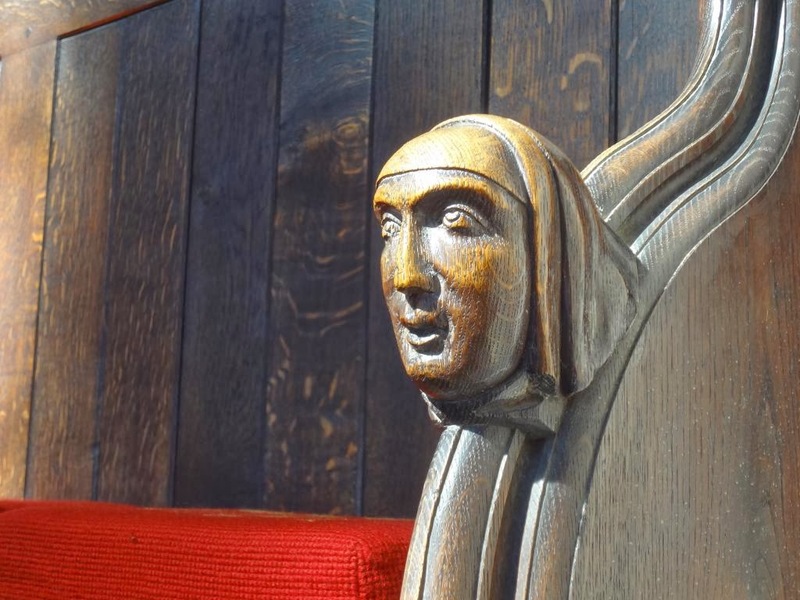 Auðunn had a statue of St Thorlak made and set up in a church there. One day an English cleric came into the church and saw it, and asked whose likeness it was supposed to be. He was told it was St Thorlak, a bishop from Iceland, at which he burst out laughing. 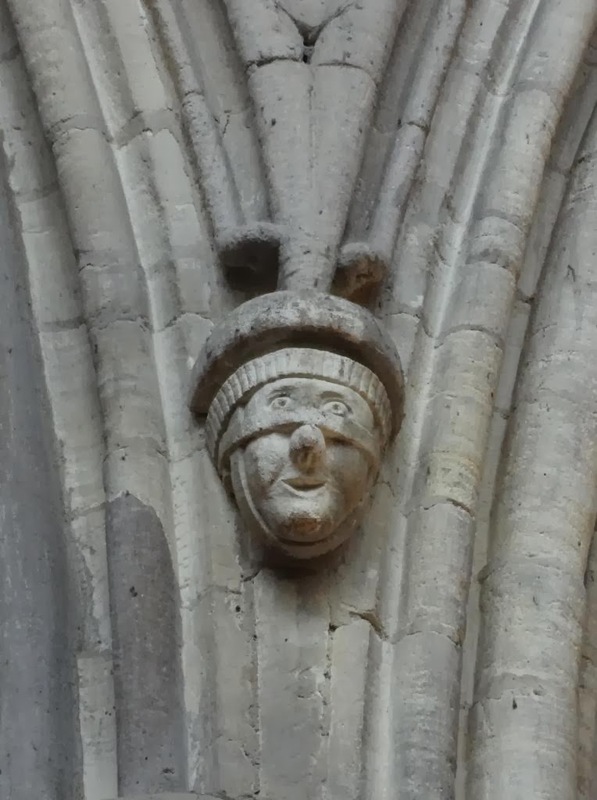 He went into the kitchen and got a bit of sausage, and came back into the church in front of the statue; he held out the sausage to the icon, and said to it mockingly, "Want a bit, suet-man? You're a suet-bishop!" 'Suet-man' (mörlandi) was a derogatory name for Icelanders. Having had his joke, the cleric turned to go; but he could not move from the place where he stood, with his hand clenched immovably around the sausage. People flocked to see the miracle, and asked how it had happened. The cleric confessed his foolishness in front of them all, and repented of it (well, you would!). He begged them to pray for him, and after a time he was freed from his miraculous frozen state. And ever afterwards he learned to treat St Thorlak with respect. That's how Icelandic saints win converts! This tongue-in-cheek carol for the end of Advent was written at the end of the fifteenth century, when Advent was a season of fasting almost as strict as Lent. 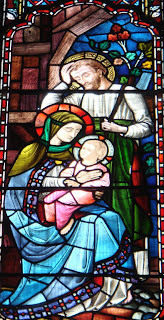 It comes from the carol collection of James Ryman, a Franciscan friar who lived in Canterbury, and Ryman himself may be the author; on his authorship of this carol, the eminent carolologist Richard Greene commented in his 1962 A Selection of English Carols: "One is inclined to doubt that this carol is of Ryman's own composition, in view of the more patent piety of the rest of his work, but perhaps it is unjust to deny him the possibility of some lighter moments". That made me laugh. This is in modern spelling, because the vocabulary is fairly simple; the original can be found here. Farewell, Advent, Christmas is come! Farewell from us both all and some! Just once a week, and that too soon! To make our cheeks both bare and lean. I wish you were at Boughton Blean! Go hence, or we will break thy pate! Be we merry now, all and some! 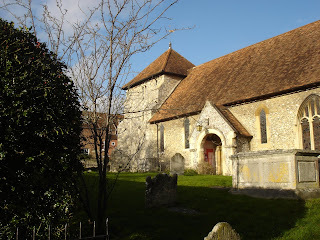 Ryman's connections with Canterbury help to explain the references in verses 9 and 10 - Boughton-under-Blean is a little village just outside Canterbury, and since it was on the pilgrim road from London to Canterbury, it gets a mention in the Canterbury Tales. There was a leper hospital there "which would have been an appropriate haven for such a meagre figure as Advent", or so says Richard Greene. As for "here nor in Kent", there was apparently a proverbial expression, "neither in Kent nor Christendom", i.e. 'nowhere'; the phrase appears in Spenser's Shepheardes Calendar. I'm in Kent at the moment, and can testify that Christmas will, indeed, be more welcome here than Advent! 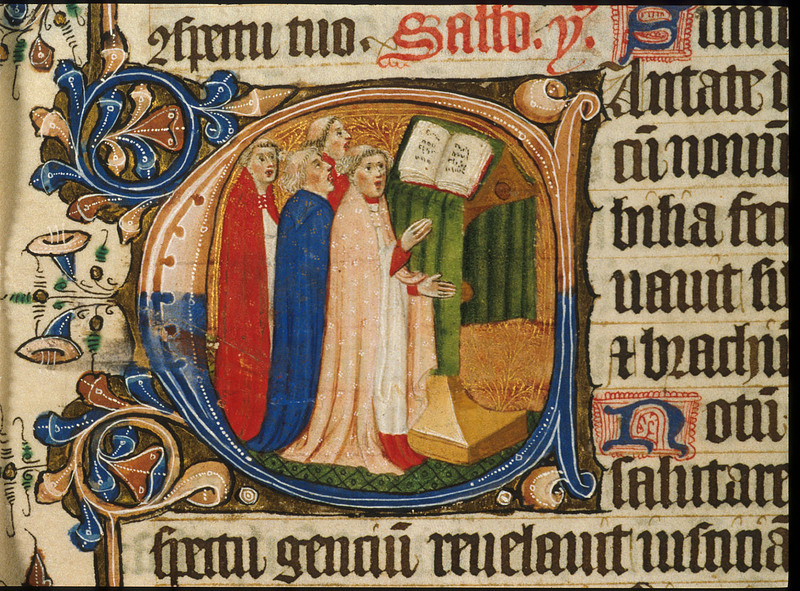 This lullaby carol is from a manuscript of the 1370s, which belonged to a Franciscan friar named John of Grimestone. The manuscript is a kind of 'commonplace book' with notes for his own preaching, mostly in Latin, and various short poems jotted down throughout - perhaps things he had composed himself, or things he had heard and liked. 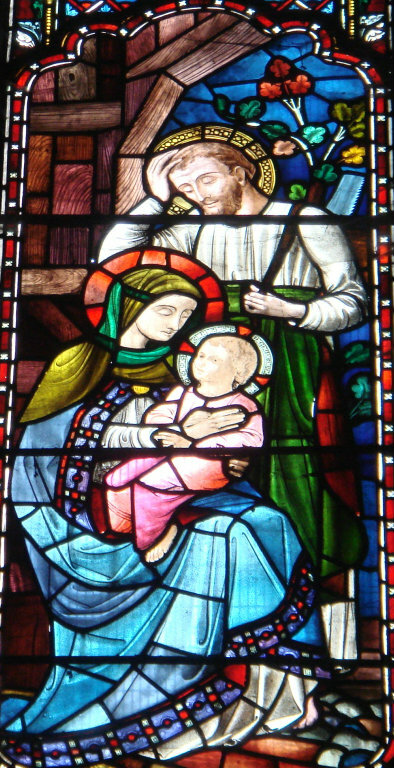 In this carol a sinner, standing in for all mankind, addresses the infant Christ. Note that the refrain also appears in this poem (as well as in some others), suggesting the phrase had a wide currency. Mercy, Lord, I have done amiss! Indeed, I will never more. And now thou weepest therefore. If it were not for thy weeping. And yet weep well more. Why wepest thou so sore? To saven that was forlore. Iwis, I wile no more. And nou thou wepest therfore. Yef thy weping ne wore. That thou hast loved so yore. And yet wepen wel more. For God’s sake – for Christ’s sake – for your own sake – keep that in mind, that Christ’s will, and therefore God’s will, is to help and deliver us; that he stands by us, and comes among us, for that very purpose. Consider St Paul’s parable, in which he talks of us as men running a race, and of Christ as the judge who looks on to see how we run. But for what purpose does Christ look on? To ‘catch us out’, as we say? To mark down every fault of ours, and punish wherever he has an opportunity or a reason? Does he stand there spying, frowning, fault-finding, accusing every man in his turn, extreme to watch what is done amiss? If an earthly judge did that, we should call him – what he would be – an ill-conditioned man. But dare we fancy anything ill-conditioned in God? God forbid! His conditions are altogether good, and his will a good will to men; and therefore, say the Epistle and the Collect, we ought not to be terrified, but to rejoice, at the thought that the Lord is looking on. However badly we are running our race, yet if we are trying to move forward at all, we ought to rejoice that God in Christ is looking on. Why? Because he is looking on, not to torment, but to help. Because he loves us better than we love ourselves. Because he is more anxious for us to get safely through this world than we are ourselves. Will you understand that, and believe that, once for all, my friends? God is not against you but for you, in all the struggles of life; He wants you to get through safe; wants you to succeed; wants you to conquer; and He will hear your cry out of the deep and help you. And therefore when you find yourselves wrong, utterly wrong, do not cry to this man or that man, "Do you help me; do you set me a little more right before God comes, and finds me in the wrong and punishes me." Cry to God Himself, to Christ Himself; ask Him to lift you up; ask Him to set you right. Do not be like St. Peter before his conversion, and cry, "Depart from me, for I am a sinful man, O Lord; wait a little till I have risen up, and washed off my stains, and made myself somewhat fit to be seen."—No. Cry, "Come quickly, O Lord—at once—just because I am a sinful man; just because I am sore let and hindered in running my race by my own sins and wickedness; because I am lazy and stupid; because I am perverse and vicious, therefore raise up Thy power, and come to me, Thy miserable creature, Thy lost child, and with Thy great might succour me. Lift me up, because I have fallen very low; deliver me, for I have plunged out of Thy sound and safe highway into deep mire where no ground is. Help myself I cannot, and if Thou help me not, I am undone." Do so. Pray so. Let your sins and wickedness be to you not a reason for hiding from Christ, who stands by; but a reason, the reason of all reasons, for crying to Christ, who stands by. And then, whether He delivers you by gentle means or by sharp ones, deliver you He will, and set your feet on firm ground, and order your goings, that you may run with patience the race which is set before you along the road of life and the pathway of God's commandments wherein there is no death. This, my friends, is one of the meanings of Advent. This is the meaning of the Collect, the Epistle, and the Gospel. – That God in Christ stands by us, ready to help and deliver us; and that if we cry to him even out of the lowest depth, he will hear our voice. And that then, when he has once put us into the right road again, and sees us going bravely along it to the best of the power which he has given us, he will fulfil to us his eternal promise, "Thy sins – and not only thy sins, but thine iniquities – I will remember no more." N.B. the Epistle for the 4th Sunday of Advent, to which he refers, is Philippians 4.4-7 ('Rejoice in the Lord alway') and the Gospel is John 1.19-28. 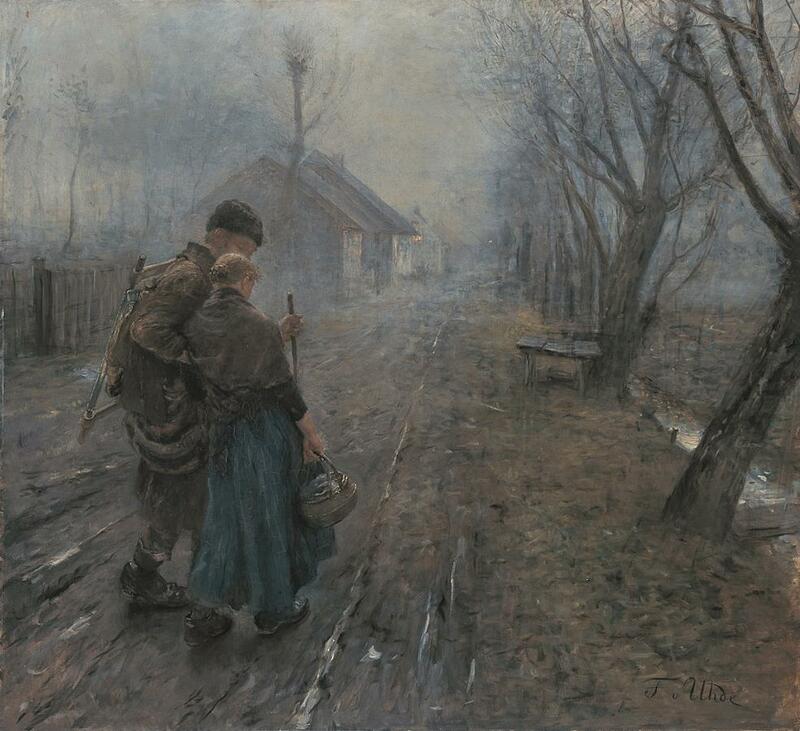 The picture is Fritz von Uhde's 1890 painting 'The Hard Path (The Road to Bethlehem)', a translation of the German title, 'Schwerer Gang'. Last year around Christmas I was interested in (and posted here) a number of medieval lullaby carols. It's a genre I find particularly moving, I think because it's so personal and intimate; not having my own baby to sing lullabies to, I'll have to be content with the carols! So I'm going to post a few later examples this Christmas season, starting with this, which is known as 'Watts' Cradle Song'. It was written by Isaac Watts but seems to have entered folk tradition, set to this tune; in that form it was collected by Vaughan Williams in Northumberland. Seven verses of Watts' fourteen are included in The Oxford Book of Carols, but with the assistance of Google Books, I've included four more (nos. 5-7 and 11 here) because I like them. Must he dwell with brutal creatures? How could angels bear the sight? To receive the heavenly stranger? Did they thus affront their Lord? Here's no ox a-near thy bed. This Advent hymn is not one of the most popular, but I like it; the last verse is absolutely perfect. Its author, Joseph Anstice, was a talented classical scholar, who took a double first at Christ Church, Oxford, in 1831, and was appointed Professor of Classical Literature at King's College, London, at the age of 22 (ouch; those were the days to be an academic!). He won the Newdigate Prize while he was at Oxford, for a poem on Richard the Lionheart, and wrote a number of well-regarded essays on classical subjects; but his career was cut short by ill-health, and he died in 1836, at just 27 years old. A collection of his hymns was published posthumously (and some of them can be read here), though 'When came in flesh' is the only one that is sung today. It's usually sung to the tune 'Walsall', a dramatic, stately kind of thing attributed to Henry Purcell - beautiful in its way, but to my ears a little out of keeping with these words, which deliberately draw careful distinctions between the extremes of noise and quiet, meekness and power, awe and love. That God had sent his Son. Shall tremble at the sign. By having burst the grave. The gracious and the true? Be but the veil withdrawn. It's Jane Austen's birthday today, and since I was in Winchester last week and took a couple of Austen-related pictures, here they are, with some additions from Bath last year. Happy birthday, Jane! You got to me when I was ten years old, and no writer has had such lasting influence on me; I owe you a very great debt. It's right next door to Winchester College, which for some reason I find amusing. I wonder how the Austens got on with the little Wykhamists, whose motto 'Manners makyth man' might be an appropriate epigraph for some of Austen's own work. Jane Austen's father George was also buried in the churchyard in 1805. The church was rebuilt in 1777, and in 1828 my own great-great-great-great-grandparents were married there. The first part of a three-poem sequence by Thomas Hardy, written in 1896. 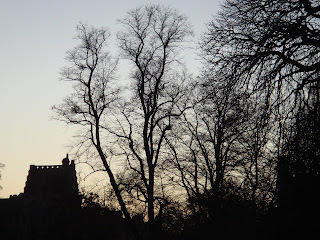 In John Donne's time, this was the shortest day of the year - St Lucy's, 'both the year's and the day's deep midnight'. This setting of his poem (charming pronunciation and all) is heart-breaking. John Donne's effigy in St Paul's Cathedral, based on a drawing of him in his death-shroud. 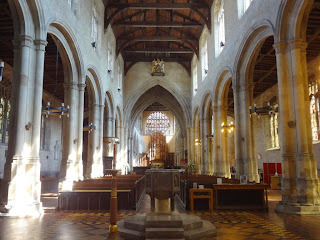 I went to Winchester recently, which as the capital of Anglo-Saxon Wessex and one-time capital of England is, unsurprisingly, full to bursting with memorials to medieval people. This was fun for me. 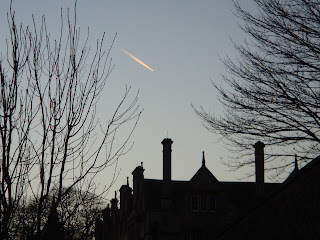 I took lots of pictures, and here is a wander through some of them. Good old Alfred the Great. Winchester was his capital, and he is naturally very prominent here (this statue is in the marketplace, in the middle of a traffic island). I am totally onboard with this, because who doesn't love Alfred the Great? 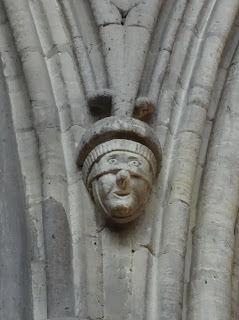 Here he is in the cathedral, just above one of the doors on the west side. His palace was about twenty feet away, though in Alfred's time there was no cathedral: there was instead the great Old Minster, and a little way away Nunnaminster, which was founded by Alfred and his wife Ealhswith. 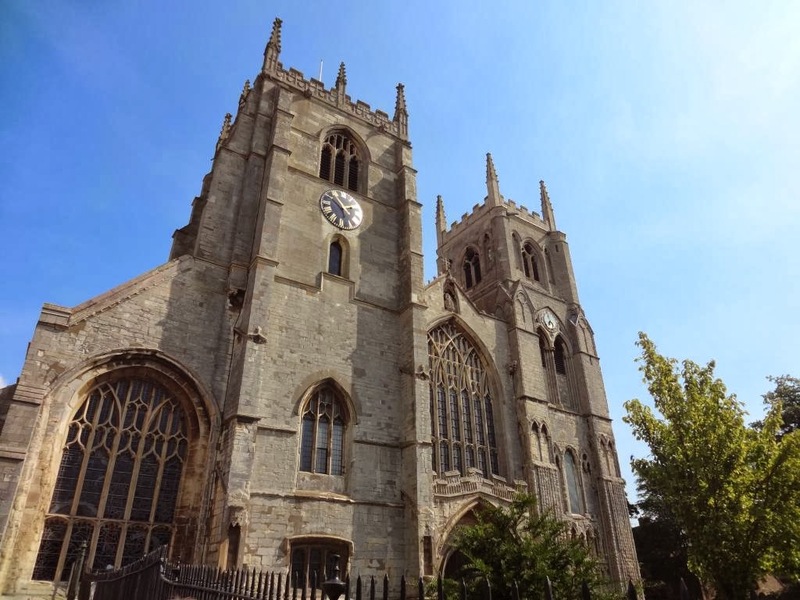 Alfred's son Edward the Elder founded the New Minster, which was later to move outside the city and become Hyde Abbey (more on that in a little while). 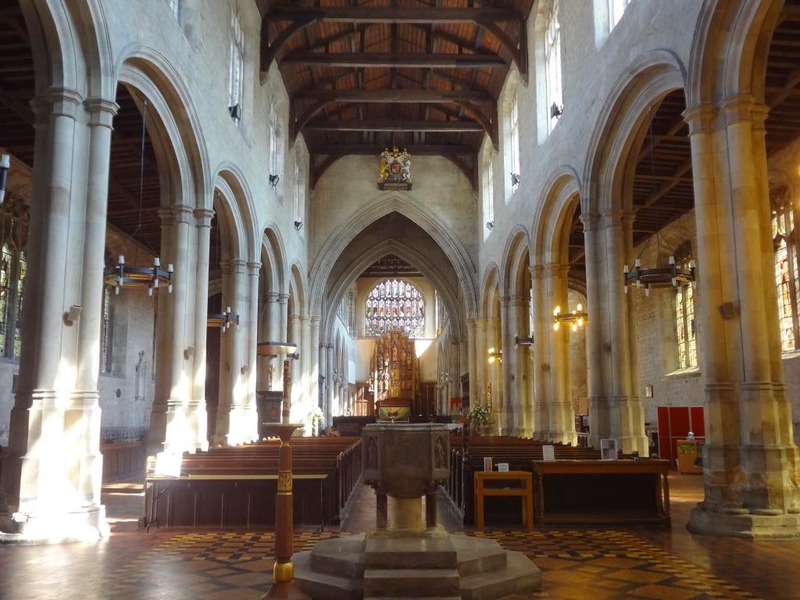 The religious houses of Winchester, not to mention the royal palace, were thus packed as tightly together within the city as Oxford colleges or the buildings of Westminster today; and this was the Anglo-Saxon equivalent, a hub of political and religious power. Just across from Alfred and his turquoise stockings is Ethelbert, equally colourful in yellow and blue, and carrying a formidable sword. There were some other Saxon kings between them, but the doorway covered up their names/ruined my pictures. Right at the other end of the cathedral is this splendid chapel. The reredos is a memorial to Charlotte Yonge (hurrah!) and very nice it is too - an Annunciation scene, which I'll post about another time. Above it is a window which shows a number of kings, queens, bishops and assorted benefactors of Winchester. This is Cynegils, one of the very earliest kings of Wessex, wearing perhaps the least likely regalia one could possibly dream up for a seventh-century king, but with a good resolute kind of face. One of the things Cynegils is famous for (at least in my part of the world) is being baptised by St Birinus in the River Thame, near Dorchester, in c.635. However, the bishop shown with him here is not Birinus (we'll come to him in a bit) but Thomas Langton, who was bishop of Winchester before he became Archbishop of Canterbury (for five days), and who lived nearly a thousand years after Cynegils. Next to him is Alfred again, of course, carrying a book which I think is supposed to be some representation of the phrase 'England's darling' (it looks like 'Leofs Angliae', which is neither Latin nor Old English as far as I can see!). Alfred is first called 'England's darling' in the twelfth-century Proverbs of Alfred, whose misattribution to Alfred is itself testimony to his lasting reputation in England. He is here keeping company with Bishop William of Wykeham, founder of Winchester College and of New College, Oxford. I think he and Alfred the educator probably would have found some common ground. These two, perhaps not so much! 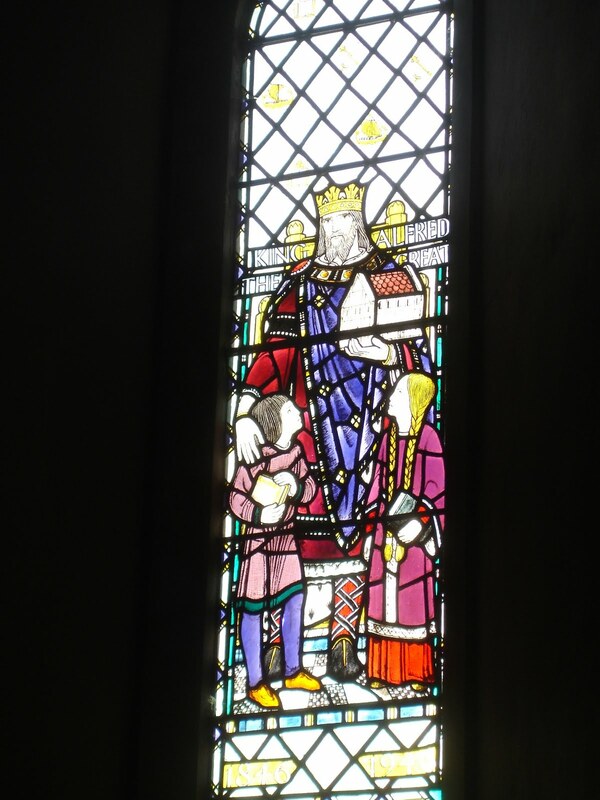 On the right is Edward the Confessor, whom we have encounted before in stained glass many times; but on the left is Cnut, looking less like a Viking than anyone I have ever seen. I wonder if this is the only stained glass Cnut in the country (we might compare it to this depiction of his Norwegian rival Olaf Haraldson over in Suffolk. I googled 'stained glass Cnut' but most of the results were from this blog, so I guess I've cornered the market on this one). Winchester was Cnut's capital too - the capital of a pan-Scandinavian empire - and he was lavishly generous to the churches of Winchester (as well as many other places in England); this famous and beautiful depiction of his generosity was produced at the New Minster, a stone's throw away from this spot. He was of course Edward the Confessor's stepfather, though they probably never met; here they have matching beards, which gives them, in posterity, more in common than they ever had in life. On the other side of Cnut is Queen Victoria - a splendid depiction, but equally odd company for him! This is the one with Cnut's name on it, but who knows whose body it contains. I've spent this whole term and a good part of the past three years with Cnut, so I am very fond of him, and this makes me sad. I know they're only bones, but still... However, it is a little better than what happened to Alfred the Great, who was buried at the New Minster: after his body was transferred to Hyde Abbey when the house was refounded, the site of his grave was lost at the Reformation. This is what remains of Hyde Abbey - the gatehouse. Another casualty of the Reformation (we really should stop calling it that) was the great reredos of the cathedral, above the high altar. It was repopulated with statues in the nineteenth century, which are very nicely done. I couldn't get many decent photographs of them - too dark and far away - but that's never stopped me posting my photos before, so here are the least bad/my favourites. Here's Cnut, with a bit of a swagger. This is Queen Emma, wife to Ethelred and Cnut, mother of Edward the Confessor and Harthacnut, patron of the invaluable Encomium Emmae Reginae, etc. She lived in Winchester after Cnut's death, right up until the 1050s, and she was a generous benefactor of religious houses (she gave the head of St Valentine to the New Minster! ); so she certainly deserves her place here. This is her son Edward the Confessor. You'd think they wouldn't like him much at Winchester, since it was mostly because of him that the capital of England moved, eventually, to London, but perhaps they've got over it in the past 1000 years. I like this depiction of him - not too old, as he sometimes is, and somehow elegant. This is St Birinus - I said we'd get to him. I missed his feast-day this year but he's an important saint to Oxfordshire and important to me personally; I must post about him properly some day. And I had to include this, because it's Godwin, who choked to death (maybe) at Winchester in 1053 after (maybe) lying about his part in the murder of Edward the Confessor's brother. He was buried at Winchester but doesn't even seem to have made it into the mortuary chests - "perished as though he had never been", for all his greatness. No wonder he looks pensive. Oswald, the English Constantine, played an important role in Cynegils agreeing to be baptised by Birinus, and the coming of Christianity to Wessex (he stood godfather to Cynegils), so he deserves some credit in Wessex's great cathedral. And another Northumbrian features in the window commemorating Isaac Walton - St Wilfrid. Here's St Swithun, from the tiny, delightful church of St-Swithun-upon-Kingsgate, which is literally a room above a gate in the city wall. 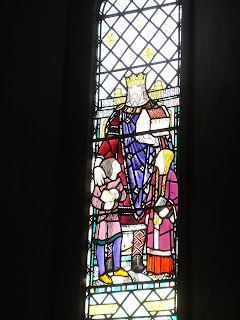 And next to him in the same window is the great Bishop of Winchester, Æthelwold, one of the leaders of the tenth-century Benedictine Revival. 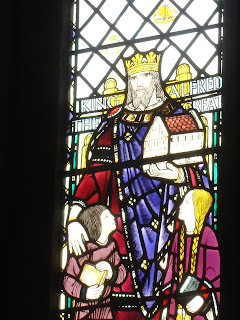 And here's a larger view of this Alfred, so you can see his rather striking cross-gartered stockings, not to mention that Saxon child's plaits. 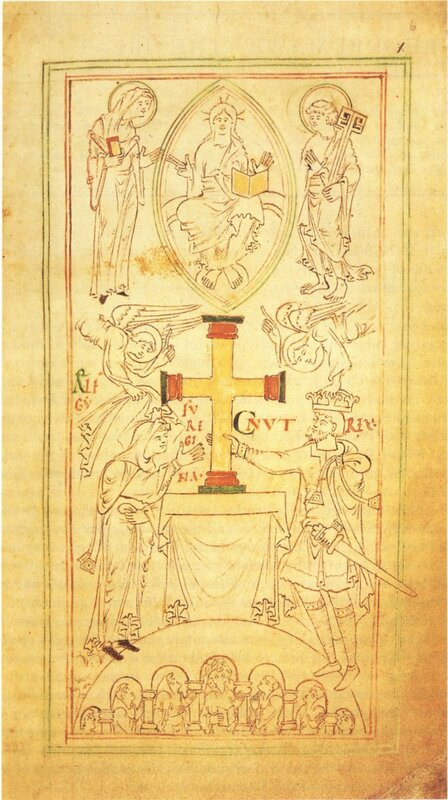 I have no idea whether Anglo-Saxon kings really did wear cross-garters, but modern artists always have them dressed that way (I note that Cnut isn't wearing them in the New Minster Liber Vitae picture linked above, but then, he was a Dane, and their fashion sense is often remarked upon disdainfully by medieval English writers...). Probably could have done with those at Hastings, Harold. He was executed in Winchester in 1076, though this was the only reference to him I could find anywhere in the city. Poor Waltheof - at least he got a crest. I suppose he was a local man, from Southampton - and Guy did some great deeds in Winchester, though himself an Oxfordshire boy. But if I were going to design a crest for Bevis, I'd at least put his awesome super-horse on it, not lions and a nightcap. Sheesh. And Guy could have his dragon, and the Danish giant he supposedly slew out on Hyde Meadow, where the leisure centre now is. By most standards this replica of the Round Table would be very old (it dates to c.1275!) but somehow in this context, and in the light of all Winchester's Anglo-Saxon and Anglo-Danish history, it felt very modern indeed.